Yesterday we took in a non-Rockers derby event up in London. 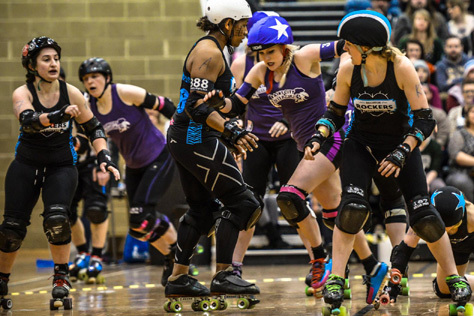 The main bout featured the London Rollergirls all-conquering A-team Brawling up against Cardiff’s Tiger Bay Brawlers, the only European team to have ever beaten LRG’s B-team Brawl Saints (although Brighton have come close behind closed doors). 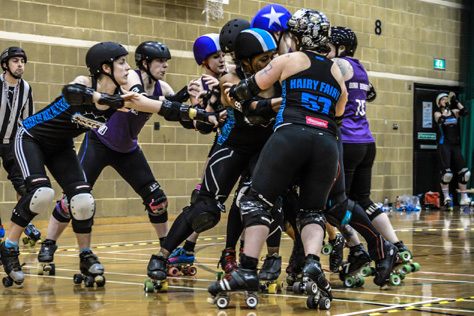 The Brawling v Brawlers bout was notable for being a testing game for WFTDA’s mooted new 30-second penalties rule, and did as intended do away with much of the ‘negative’ tactical play – passive offence, as it’s called – that has been criticised in recent years. As far as the result was concerned, that was never in doubt as London built on a 20-0 opening jam to hold a 100-point lead barely ten minutes into the match. The final score was 500-30. Of course it was great to watch the amazing skills of the Brawling roster (and Tiger Bay’s Kid Block, amongst others), but as a ‘contest’ it was hardly edge-of-the-seat stuff. 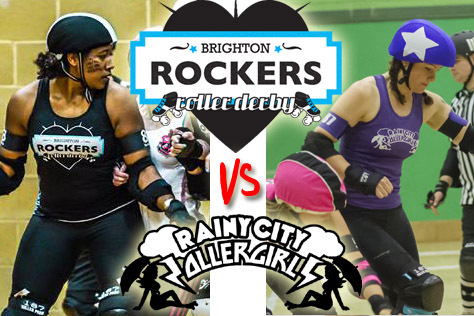 What a comparison with Brighton’s last bout; a 170-156 home win over Central City that saw the Rockers overturn a half-time deficit, with a final 15 minutes involving at least half a dozen re-tied scorelines or lead changes. 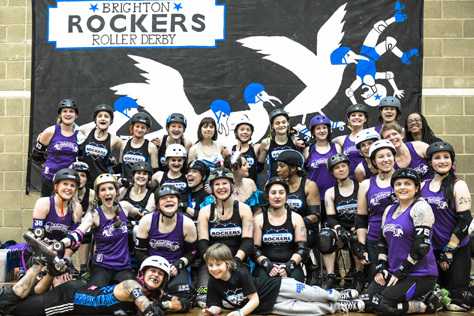 They say the close games are the best ones to watch, and the bout that kicks off Brighton’s 2014 season this Saturday is widely predicted to be one of those. 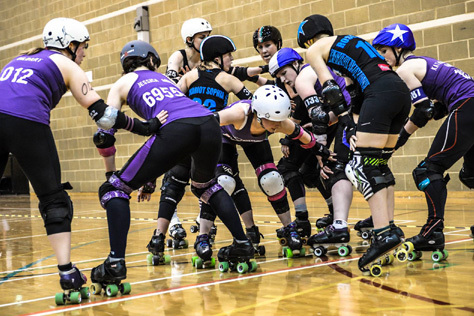 Opponents Rainy City Roller Girls (from Greater Manchester) currently rank fifth in the official UK Roller Derby Association table with 666.5 points. The Rockers are tenth on 644.5. The flatttrackstats.com website predicts, based on these rankings, a 60% chance of victory for the visitors with an anticipated score differential of 19-17. The same site’s Europe-wide ranking system has Rainy in 14th (671.9) and Brighton 17th (658.3) and predicts a 53% chance of a Rainy win, with the visitors picking up 34 points for every 33 that Brighton score. That’s one of the closest differentials we’ve ever witnessed on a bout predictor – certainly the closest involving Brighton – and would equate to a typical scoreline of, say, 165-170. Wow! The game takes place this Saturday 15th February at the Dolphin Leisure Centre in Haywards Heath, about five minutes walk from Haywards Heath station on the London-Brighton mainline. (Turn left outside the station and follow the roller derby signs stuck to lampposts, trees and small dogs.) The pub opposite the train station, the Burrell Arms, is footbally but decent enough for a station pub. 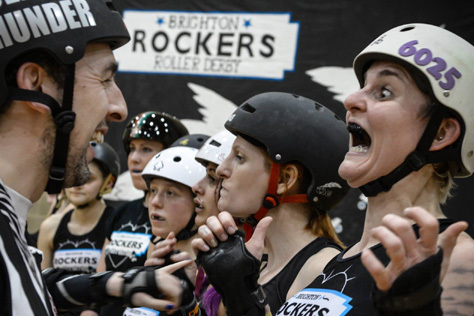 The after party is back in Brighton in the Rockers beloved home pub, the Cornerstone on the corner of Elm Grove and Lewes Road, and will once again feature the league’s own beer Off Your Rocker. The bout venue itself has a café bar in its foyer and a smaller (but better stocked booze-wise) sports club bar a few corridor turns past reception. 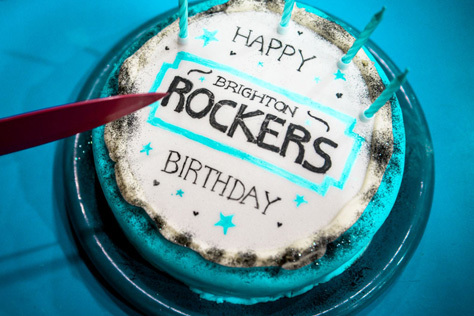 The game marks the Rockers’ fourth birthday, so don your best birthday outfit – NB not ‘birthday suit’ – and party hat if you’re fancy dress inclined. Doors open at 2.30pm with the bout scheduled to start at 3pm. Tickets are priced £10 adults and free for under 12s. These are still available while they last (Rockers bouts often sell out) from the link at the bottom of this piece. “The Rockers are one of those leagues that I’ve had very few dealings with, and yet I’m relatively close to and/or know a number of people involved with the league. Mistress and I have been trading barbs/knowing looks since the first Men’s Euros in 2012; Noise and Banger know me – and I them – from the infield, likewise Mercy, Scoot’er and LaserHammer; Bash is someone whose path has crossed mine numerous times since 2010 due to my involvement with London Rockin’ Rollers; and whether she remembers it or not, Mother Trucker and I had a conversation about her getting involved in derby back when she watched her sister play for Leeds Roller Dolls in Huddersfield.